Press Release (ePRNews.com) - SAN FRANCISCO - Jan 22, 2018 - ​Reposify, a cybersecurity company which identifies, manages and defends organizations’ global digital assets, has just released their flagship product, Reposify Grid. Grid offers a wakeup call to enterprise organizations everywhere – generating a comprehensive digital footprint by locating and mapping digital assets (internet-connected devices) that companies are completely unaware of while providing real-time alerts about security issues, such as data leakages, shadow IT, misconfigurations, phishing attacks and other breaches. This presents a considerable problem within leading digital asset security solutions. All too often, tools are implemented but don’t offer sufficient protection. Companies are lulled into a false sense of security by a high Cyber Risk score, but it’s incomplete at best. These scores usually only focus on part of the picture, such as third-party assets or assets in the company network, and don’t give a score that represents the entire digital footprint and company’s vendor supply chain. More assets are then added, and the vulnerability gap grows exponentially. “We’ve found that even big-name enterprise organizations are not aware of all of the digital assets that they own. Many companies think they’ve mapped out their entire asset ecosystem and are later surprised when they come to use Reposify’s Grid system. We had one company who was shocked to discover that they were only mapping 40 percent of their total digital asset environment – at the expense of uncharted assets and third-party assets. We’re finding this to be the case with more and more companies that we work with – who are unaware that they’re being exposed to an all-out security crisis because of unmapped digital assets,” said Yaron Tal, CEO of Reposify. Unlike other digital asset security solutions, which only map a selection of assets, Grid’s technology continuously monitors the global internet to locate and map an organization’s hidden assets. It locates the device type and attributes, organizing assets by device type, vendor, technology stack and more. Then, it inspects and assesses the assets in the entire ecosystem using a proprietary algorithm and machine learning. 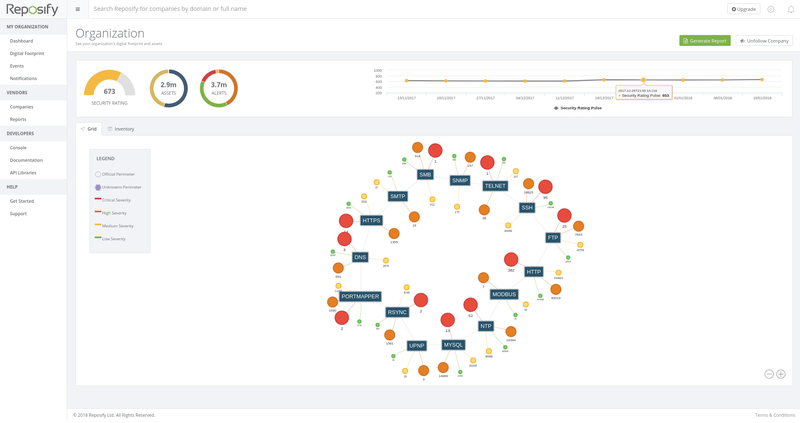 All of this data is then used to generate a complete, 360-degree security rating report for the organization’s assets, including all third-party vendor-managed assets. With data breaches running rampant and Europe’s GDPR (General Data Protection Regulations) deadlines creeping up, companies remain unprepared and are struggling to reach or maintain compliance. The problem becomes amplified in an industry facing a deficit of over one million cybersecurity personnel while facing a predicted 200 percent increase in cyberattacks by 2021. Companies are scrambling to look for solutions that provide cyber protection while balancing a lack of manpower. Single-point cybersecurity is a paramount requirement to stop hackers from exploiting asset vulnerabilities. Meet up with Reposify at CyberTech Tel-Aviv Jan. 29-31 or at RSA April 16-20. To schedule a session, please contact us. Reposify’s cybersecurity solution identifies, manages and defends companies’ global digital footprints. The technology allows businesses to locate and map known and unknown assets beyond the firewall, at scale and provide risk and alert management to any breaches or unusual behavior, helping them achieve cyber resilience. For more information, visit us at www.reposify.com or follow us on Twitter.